In our modern society, weight concerns, obesity rates, and obsession with appearance have changed the way we look at food – and not necessarily for the better. If you have ever snacked when you weren’t hungry, have used guilt as a guide for your eating habits, or have cut calories even when you felt hungry, you have experienced mindless” eating firsthand. This mindless approach to food is dangerous, and can have serious health and emotional consequences. But if you’ve been mindlessly eating all your life, it can be difficult to make a change. When it comes down to it, you must take a whole new approach to eating-but where do you begin? Practicing mindful eating habits may be just the thing to make that important change. In fact, it might just be the answer you’ve been searching for all these years. The breakthrough approaches in Eating Mindfully, by Susan Albers, use mindfulness-based psychological practices to take charge of cravings so they can eat when they are hungry and stop when they feel full. Ten years after the release of the first edition, this book continues to help thousands of readers change the way they approach mealtime. So what’s changed? For starters, there is a new section that focuses on the “occasional mindless eater.” This second edition emphasizes that mindful eating isn’t only for those on a diet or for those who have severely problematic eating habits – it’s for everyone. In addition, this new edition features over 50 new tips for eating mindfully. Inside, you will learn how to be more aware of what you eat, get to know your fullness and hunger cues, and how to savor and appreciate every bite. You will also learn how mindlessness corrupts the way you eat, and how it can manifest in a number of different eating problems. 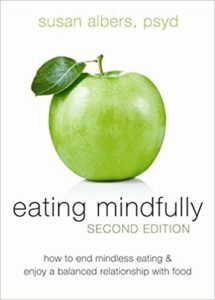 No matter where you are in your journey toward mindful eating, this book will be an invaluable resource, and you will gain insight into how mindfulness can provide you with the skills needed to control the way you eat-leading to a healthier, happier life.